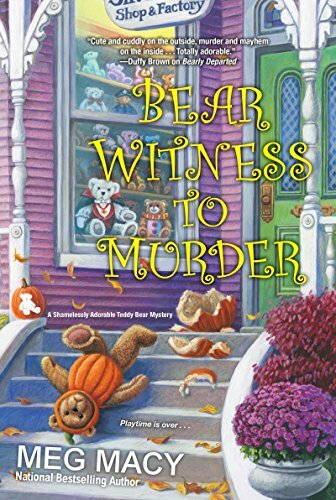 This is the second installment in the Teddy Bear Mystery Series and it was as good as the first one. This installment again returns to the town of Silver Hollow, MI, where Sasha and her sister, Maddie run the local teddy bear factory and shop. To kick off the Oktobear Festival, they help host a Cranbeary tea. There they run into an old High School nemesis of Sasha's , Holly and her assistant. When Sasha finds Holly stabbed the next morning, she becomes a suspect so she has to find the real killer to clear her name. This book was well written with an intriguing plot that kept my attention from the beginning. There were some twists and turns that kept me guessing up until the very end. I am looking forward to visiting Silver Hollow again, not only because Ms Macy is such a talented writer, but because I love teddy bears as much as I love cozy mysteries. 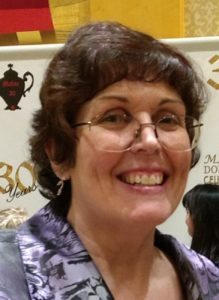 Award-winning mystery author Meg Macy lives in Southeast Michigan, close to Ann Arbor, Chelsea, and Dexter — the area she chose for the setting of her new “Shamelessly Adorable Teddy Bear” cozy mystery series for Kensington. She is also one-half of the writing team of D.E. Ireland for the Eliza Doolittle & Henry Higgins Mystery series; two books have been named Agatha Award finalists. Meg’s first published book, Double Crossing, won the 2012 Best First Novel Spur Award from Western Writers of America. She’s a graduate of Seton Hill University’s Writing Popular Fiction program. Meg loves reading mysteries, historical, and other genre fiction, and also enjoys gardening, crafts, and watercolor painting. Thank you for being part of the book tour for "
Bear Witness to Murder" by Meg Macy and your review on the book. I'd love the opportunity to read this adorable sounding book. Love the cover! Thanks, Melina, for the wonderful review! So glad you enjoyed Bear Witness to Murder. Cheers!